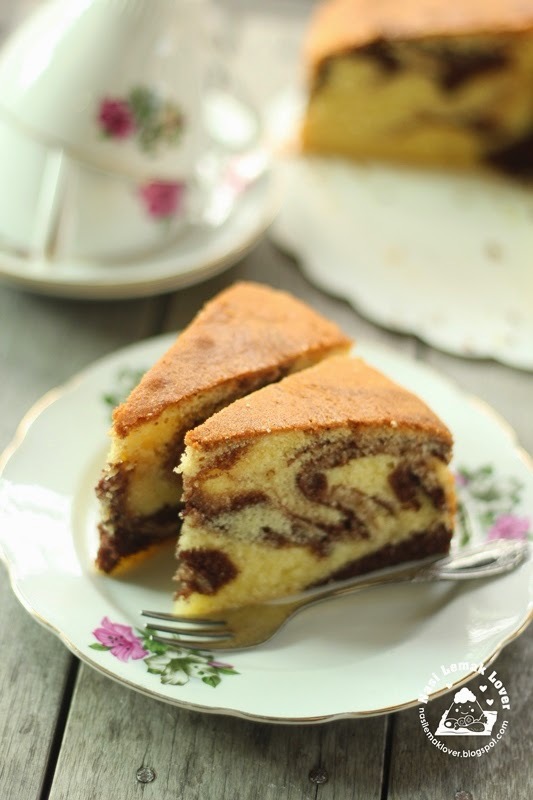 I love butter cake, especially love it when mix with some chocolate, like this marble butter cake. I have a habit to enjoy butter cake for breakfast before I started to cook big meals on CNY eve day. Last time I use to buy from pasar pagi (morning wet market) during CNY. But now I can bake this cake anytime ^_^. Add one egg at a time, beating well after each addition. After well combine, slightly increase speed and beat for 1min till fluffy. Add the flour and baking powder (sifted together) and beat well to combine, fold milk alternately and combine well. Remove 250g of plain batter and place in another clean mixing bowl, mix well with cocoa mixture. Spoon the two batters, plain and chocolate batter, alternately into the cake tin (lined base and sides). 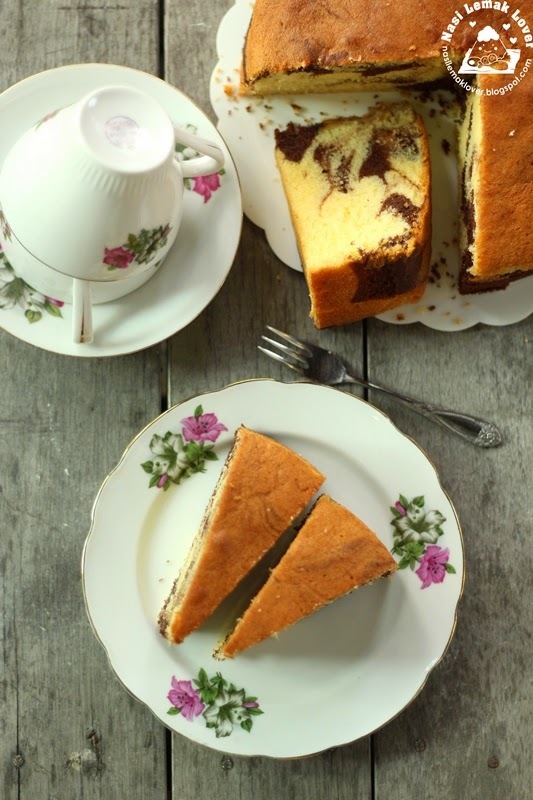 Using a butter knife, gently swirl it around the mixture in the tin a few times to create a marbled effect. Tap the tin to remove any air bubbles. Bake at preheated oven at 170c for 50-55mins or until a skewer insert and come out clean. My mum and fil super love butter cake like yours too. I don't know when I started to love butter cake too. All the best to you in the Goat year. definitely will try this recipe out. Thanks for sharing! Happy Lunar New Year to you and your family!!! Hi Ah Chi! Dropping by to wish you and your loved ones a very happy and prosperous year! Gong Xi Fa Cai! Hi Sonia, baking your own is definitely better than buying from 'pasar pagi'. Looking at the photos, I fully agree with your hubby's comment. Must try this one day. GONG XI FAI CAI to you and family. hi sonia, i have not been blogging much these days, just coming over to wish you a very happy chinese new year! gong xi fa cai! Sonia, Keong Hee Huat Chye! 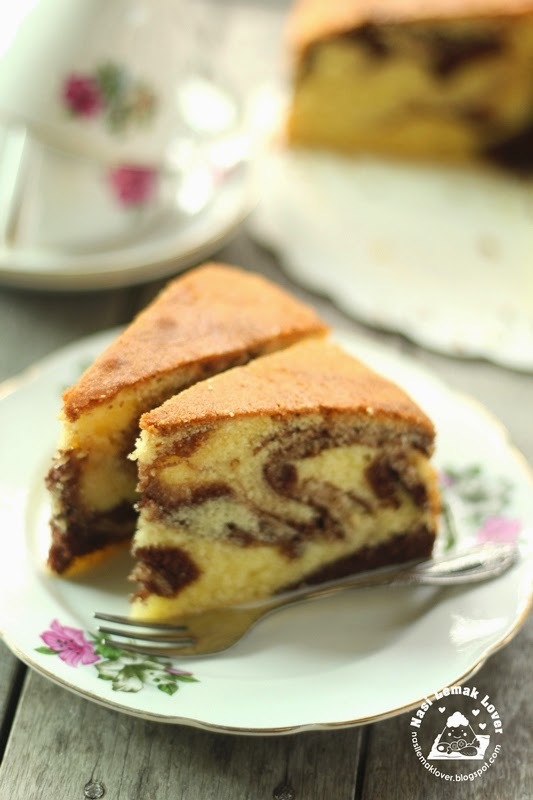 Love your marble butter cake. Regretted that I did not bake this for CNY. Happy Chinese new Year. I also not baking batter cake this year, was too busy. Must try out your recipe, thanks. Wishing you & family Gong Xi Fa Cai 恭賀新禧， 萬事如意, 新年喜洋洋! 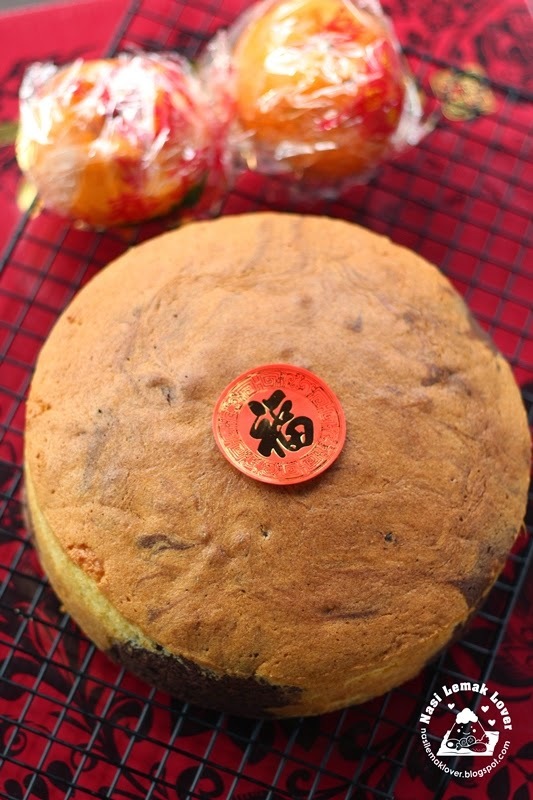 I baked this cake on 1st day of CNY & turned out very nice. Just like store bought. Great recipe. Thank you for sharing. Looks soft and moist...Love the marbe effect. Hi, Sonia! Gong Xi Fa Cai & Happy Goat Year! 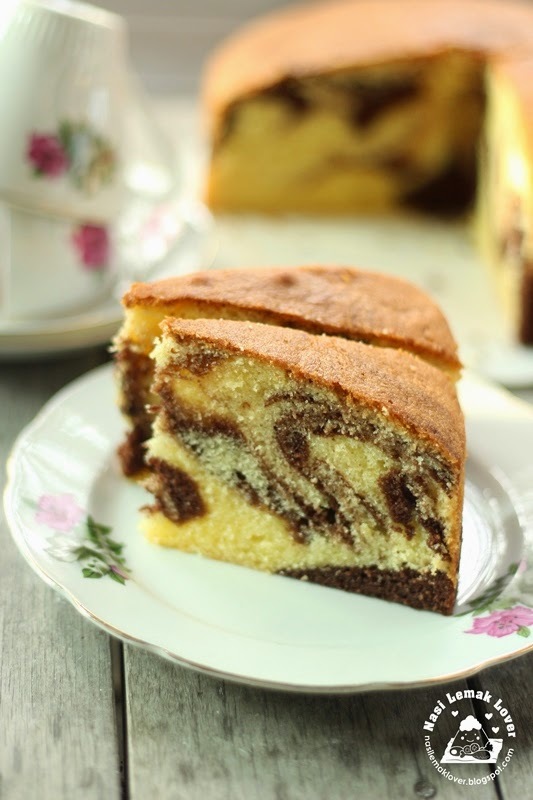 Sonia, I baked this marble butter cake after so long not baking one.I have to say it is a very good butter cake recipe. Thank you for sharing and Happy New Year to you and your family. Hi Sonia, Happy Lunar New Year! I always love Butter Cake especially the old fashion type. Thanks for sharing this recipe and I will definitely try this recipe. I love the aromatic butter fragrance of this type of butter cake! sc, please try to use cake flour instead, you can taste the difference as the cake texture will be more fine than using plain flour. I suspect the centre of the cake is not cook enough, maybe you can extend extra 5 minutes. Min, yes you can, just lined paper on bottom and the sides. Rachel, My recipe is using 8" cake pan and using 4 large eggs. So you can use all ingredients divide by 4. Then for a 9" cake pan, multiply per unit with 5 eggs, and for 6", multiply with 2 eggs. Can I know do I need to turn the butter cake upside down for it to cool down? Hi Sonia, if I omit the coffee powder, do I need to add more cocoa powder? Thanks. may I just butter and flour the tin instead linig paper? is it total 6 tbsp. of milk? The best cake ever! It was so moist and tasty. Will be making it again for sure. Thank you for the recipe. I have made few of your cakes and never once failed. You are way too good. Hello, I just tried this recipe. The batter tasted really good, but I'm curious of why my cake splitted in the middle? Any clue? Deon, your oven temp is high i supposed. Thanks for the recipe. Cake split in the middle too which is probably due to oven being too hot. Tasted really good.